Two further aftershocks have destroyed more than 420,000 houses in the Chinese region hit by a massive earthquake two weeks ago, state-run media say. Many of the homes appear to have been empty, but six people are said to have been critically injured in the tremors. They came as thousands of people were moved from near a lake formed by landslides, amid fears the water could breach banks and deluge the area. 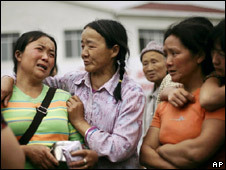 The official death toll from the 12 May quake in Sichuan province is 67,183. About 20,790 people are listed as missing, with more than five million people homeless since the earthquake. As the mountainous region continues to be shaken, 63 people were injured, including six critically, in the latest aftershocks in Qingchuan county, China's state-run Xinhua news agency reports. One of the aftershocks measured magnitude 5.7, according to the US Geological Survey. The same county was strongly shaken on Sunday, wrecking 300,000 more homes, killing eight people and injuring hundreds. Meanwhile, about 30 towns were being evacuated from near the newly-formed lake because experts fear the build-up of water at the swollen Tangjiashan lake could burst the banks, deluging the area. 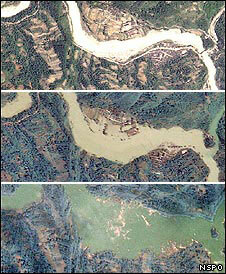 Chinese soldiers have dug a channel to ease pressure from the so-called "quake lake". They are also using earth-moving equipment and explosives to try to ease pressure on the lake's banks. Landslide debris is holding back some 130 million cubic metres (4.6bn cubic ft) of water at the site in Beichuan county. The water level in the lake has now rapidly risen to within 26m (85 feet) of the fragile dam's lip. About 70,000 people have already been moved from nearby Mianyang city, Xinhua said, with a further 80,000 still being moved. "The Tangjiashan quake lake should be our most urgent task," Chinese Vice Premier Hui Liangyu, who is overseeing the relief operation in Sichuan, was quoted as saying by Xinhua. "It is threatening millions of lives in the area downstream and any negligence will cause new disasters to people who have already suffered the quake," Mr Hui said. 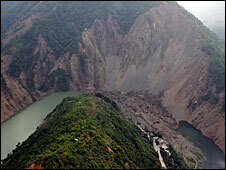 Landslides triggered by the quake have blocked dozens of rivers in the province, leading to the formation of many new lakes, some of which have already engulfed villages. Storms have been forecast for the region, potentially compounding problems as rain water drains into the lakes. Officials have said that reconstruction work in the area is set to take at least three years.